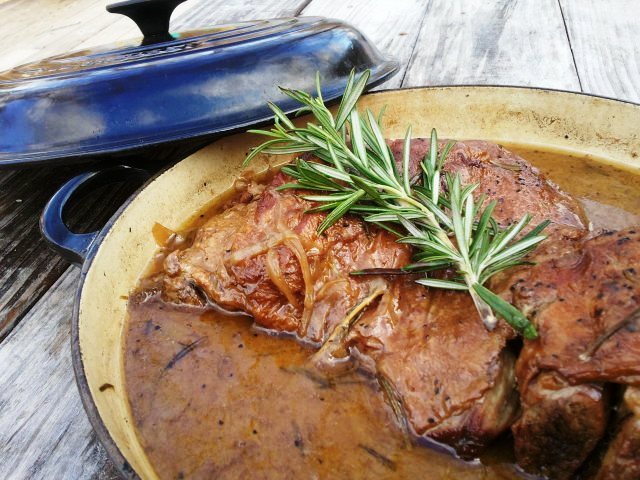 Braising is an effortless cooking method which creates a wonderful texture and develops beautiful, rich flavors in any meat. Next to pan searing, this is my second favorite way to prepare meat. This impressive and surprisingly simple dish will wow your guests. The best part about this recipe is that you can throw it together quickly and leave it for hours, and voila! Dinner is served. This is a one pot meal at it’s finest! Heat dutch oven and drizzle with olive oil. Season lamb with salt and pepper and sear on both sides about 4 minutes. Remove from pan. Add onions and garlic and cook until fragrant. Deglaze pan with red wine, scraping up any bits on the pan using a wooden spoon. Place lamb back in the liquid and bring to a boil. Cover and simmer for 3-4 hrs, until fork tender. Turning meat once every hour. Serve with braising liquid over Cauliflower Mash or potatoes. Some notes on this recipe: Once you have completed the recipe through step 6, you have a few options. You can continue to cook on the stove top, or place in a 300 degree oven. 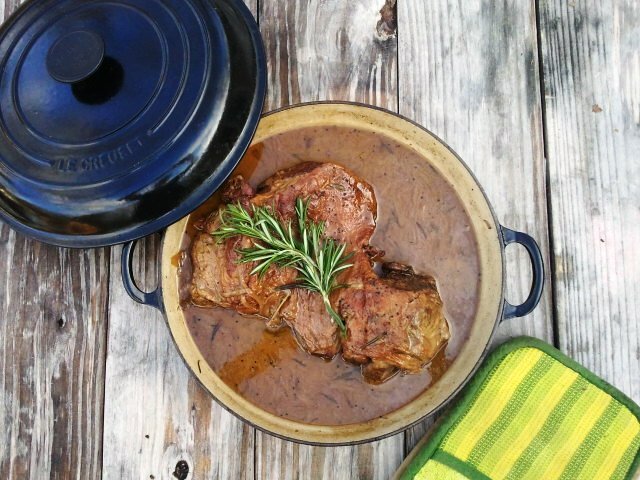 Alternatively if you do not have a dutch oven, you can prepare the lamb in a regular pan then finish the cooking in a crock pot. I suggest while doing your menu planning, figure out if you need more space in the oven or stove top for other dishes. This recipe can be made ahead of time and reheated. Perfect for bringing to an Easter dinner. I always sign up to bring several dishes for holidays, because I am guaranteed and “safe” meal!